Saturday, Dec. 22, 1888 20°+ this morn, & 40° P.M. with strong breeze from south, but clear most of day. 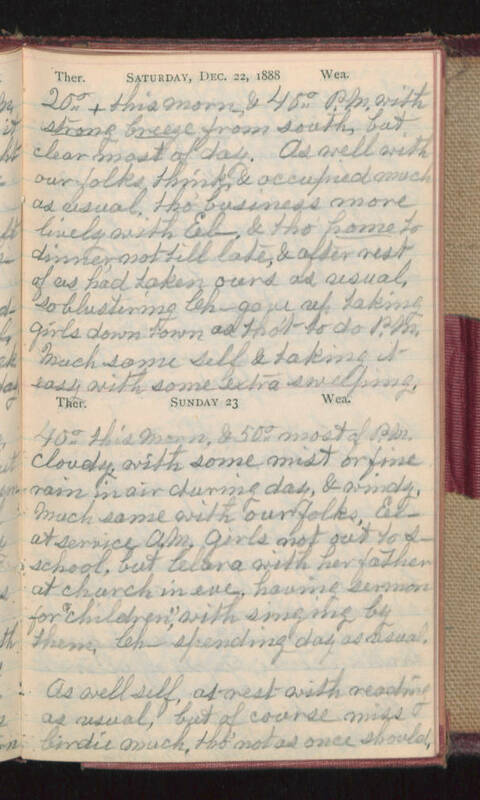 As well with our folks think, & occupied much as usual, tho' business more lively with El-, & tho' home to dinner, not till late, & after rest of us had taken ours as usual, so blustering Ch- gave up taking girls down town as tho't to do P.M. Much same self & taking it easy with some extra sweeping. Sunday 23 40° this morn, & 50° most of P.M. cloudy, with some mist or fine rain in air during day, & windy. Much same with our folks, El- at service A.M. girls not out to s-school, but Clara with her father at church in eve, having sermon for "children", with singing by them. Ch- spending day as usual. As well self, at rest with reading as usual, but of course miss birdie much, tho' not as once should.